Here is a list of all the authors flashing this week, along with a brief snippet from their latest free work. Click the link after the snippet to be taken to the complete story on the author’s home page. Patrick and Tristan rounded the hallway corner just in time for Tristan to have the wind knocked out of him by a blur of pink. More people ran up as Tristan tried to catch his breath and hold on to the now wriggling pink lump in his arms. The wiggling stopped and a far too intelligent gaze captured his. He got lost in that gaze for a few moments before yelling got his attention. This entry was posted in Wednesday Briefs and tagged Carol Pedroso, Cia Nordwell, Flash Fiction, Free Stories, J. Alan Veerkamp, Julie Lynn Hayes, Wednesday Briefs on February 27, 2019 by wedbriefsfic. I’d been separated from everyone. The Elites didn’t look at me, didn’t talk to me. Shivers wracked me as I was hauled away, my hands bound behind my back with strong shackles. I wanted to vomit up that last meal we’d had, or cry, or drop to my knees and not move. But none of that would help me. None of that would help the others. This entry was posted in Wednesday Briefs and tagged Carol Pedroso, Cia Nordwell, Flash Fiction, Free Stories, J. Alan Veerkamp, Julie Lynn Hayes, Wednesday Briefs on February 20, 2019 by wedbriefsfic. “What’s on the schedule for tonight?” Ryan asked Ben as they crossed the back lawn, hand in hand. “We’re playing at a place they call The Dive,” Ben replied. “It’s an underground club in Houma, about an hour and half from here Sorry, we’ll have to go across the bridge again. That’s the fastest way there.” He glanced at Ryan, offering him an apologetic smile that was also filled with concern. “No worries. It’s not scary at all when I have you beside me,” Ryan said sincerely. This entry was posted in Wednesday Briefs and tagged Carol Pedroso, Cia Nordwell, Flash Fiction, Free Stories, J. Alan Veerkamp, Jon Keys, Julie Lynn Hayes on February 13, 2019 by wedbriefsfic. least 17 hours to get there. Shawn came in and I must have looked as spooked as I felt. “Vince?! What’s going on?” Shawn asked as he rushed in the door. “It’s Brady! I just got a call from Oklahoma. Some sort of an accident. This entry was posted in Wednesday Briefs and tagged Carol Pedroso, Cia Nordwell, Free Stories, J Ray Lamb, J. Alan Veerkamp, Julie Lynn Hayes, Wednesday Briefs on February 6, 2019 by wedbriefsfic. True Cross has a new student – Ambrosius Faust. But he’s actually Amaimon, passing himself off as Johann Faust’s nephew. What’s up with that? To Rin’s dismay, he claims Shiemi is his bride, but she quickly sets him straight on that count. Meanwhile, Lightning and Suguro have been investigating in the monastery where Rin and Yukio were raised. Afterward, Lightning storms into Mephisto’s bath to confront him an unofficial contract of Morinath, which is completely against order rules. Mephisto tells him the location of the treasure he seeks, and advises he go at night, and to “place the key in the hand.” Off Lightning and Suguro go! Shiemi has been wrestling with whether or not to take the exorcist exam, conflicted between her desire to please and her wishes for the future. Having made her decision, she approaches her mother, who asks that Shiemi hear her out before she makes a final decision. Lightning and Suguro find themselves beneath the monastery, in the place that was the predecessor of the cram school. This place was dismantled sixteen years before, because it was ground zero on the Blue Night! They talk to one another about their backgrounds, and then they run into an unexpected blast from the past. When Lightning accuses the newcomer of signing a contract or Morinath, he tells them where to find the Section 13 they seek. Lightning and Suguro find the ruins of what was once the cram school, as well as Section 13. It seems as though someone was experimenting with finding elixirs for immortality! Worse than that, they were delving into cloning! Mephisto, you have some ‘splaining to do! Christmas break has arrived, but the Exwires decide to stay at the school in order to study for the exorcist exam. When a discussion of birthdays arises, they decide to hold a Christmas party/birthday party for the group! The students split into groups to take care of preparations, even as they speculate on what Shiemi has just told them, trying to figure out why she made the decision that she did. I love following the ongoing investigation of Lightning and Suguro. What they are uncovering is totally fascinating, even if I’m not sure how it fits into the scheme of things. Cloning, immortality and elixirs? We learn more about the Blue Night, as well as Lucifer, while Mephisto continues to protest that he is not the enemy, and he’s certainly not helping the Illuminati. The plot is definitely thickening, and as usual, the Okumura brothers in in the midst of it, whether they know the truth or not. I also love Suguro’s character development. At the beginning of the series, I thought of him as a muscle-bound lunkhead, but there is a lot more to him than that. I’m dying to find out about why Shiemi decided what she did – what did her mother say to her? And is Yukio ever going to confide his fears to his brother? After all, two heads are better than one! The beat goes on in this volume of Blue Exorcist. Unfortunately, now I have to wait for the next one to arrive! I’ve reached the end of what is already published. I’m greatly looking forward to the next volume, whenever it comes out! 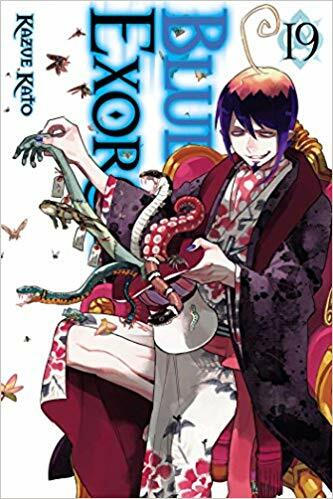 This entry was posted in Reviews and tagged Blue Exorcist, Blue Night, Book review, Julie Lynn Hayes, Kazue Kato, Rin Okumura, son of Satan, Viz Media on February 3, 2019 by wedbriefsfic.